Just enough to roll the edge over. Then try it in yourvpistol. If they don't feed then crimp a little more until they do. I've always used the crimp in the RCBS die. I prefer the case gages to check rounds. I have one each for the .45 and .38, made by Dillon, but there are other makers out there. KenO wrote: I prefer the case gages to check rounds. I have one each for the .45 and .38, made by Dillon, but there are other makers out there. 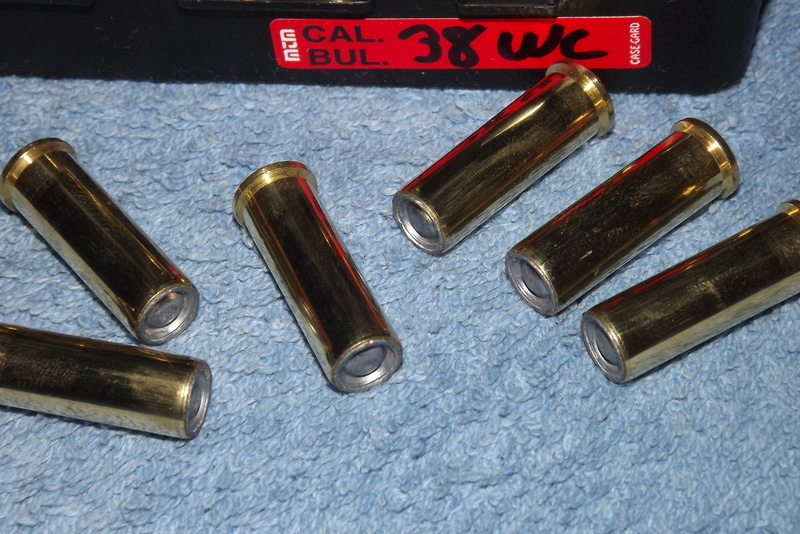 I trim all my 38 Special brass to be used in my M-52 to .010" (ten thousandths of an inch) LESS than minimum length, seat flush to the case mouth and crimp to .372. Have never had a alibi doing it this way. If you are shooting button nose WC the button will hang up on the front of the magazine in a M-52. The nose of wadcutters shot in the M-52 has to be flat. These are new Starline cases. I don't do anything to the brass. I seat the bullet just enough past the case that the roll crimp (same as I use for my RN bullets) has just enough lead to bite on. These are Magnus HBWC. I am running 2.8gr of BE and my Hornady manual shows that to be just below Max. It shows starting to be 2.1. Can I drop it down that far and still function with the Matchdot II mounted on the slide? Don, I don't think even 2.8 will work with a Matchdot II on the rail. I have a Holosun mounted on mine with 2.8. I had a frame mounted Matchdot but totally different critters. What kind of dovetail mount do you have coming that will let you use a full size scope? You have received misguided information or misinterpretation of said information. 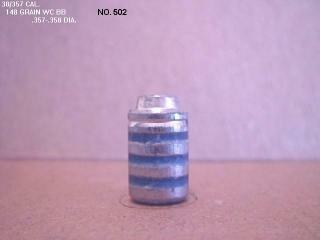 First off you can shoot any 148gr LHBWC or DEWC in an M52, button nosed or not; period. You must conclude what the COL is for the magazines you have. COL = cartridge overall length, not base of cartridge to shoulder but base of cartridge to nose. My notes state that the maximum COL for my M52 magazines must measure 1.170" or less. If all five rounds load into the magazine and do not hang up while cycling then they will feed into the pistol. My notebook is out in the shop, but I trim my once fired brass .020" and seat so the shoulder is .010"-.020" above the case and crimp. This gives me my .020" proud button nose on my now obsolete Remingtons to function fine. 2.8gr of BE is good, 2.1gr will be a single shot pistol. The manuals use a fixed barrel/revolver setup. Keep that in your equation. If you want to discuss the loading and use of the M52 in more detail, PM me and we will talk on the phone. I am still a working man at 50+ hours a week but still have time to talk shop. LenV wrote: Don, I don't think even 2.8 will work with a Matchdot II on the rail. I have a Holosun mounted on mine with 2.8. I had a frame mounted Matchdot but totally different critters. What kind of dovetail mount do you have coming that will let you use a full size scope? 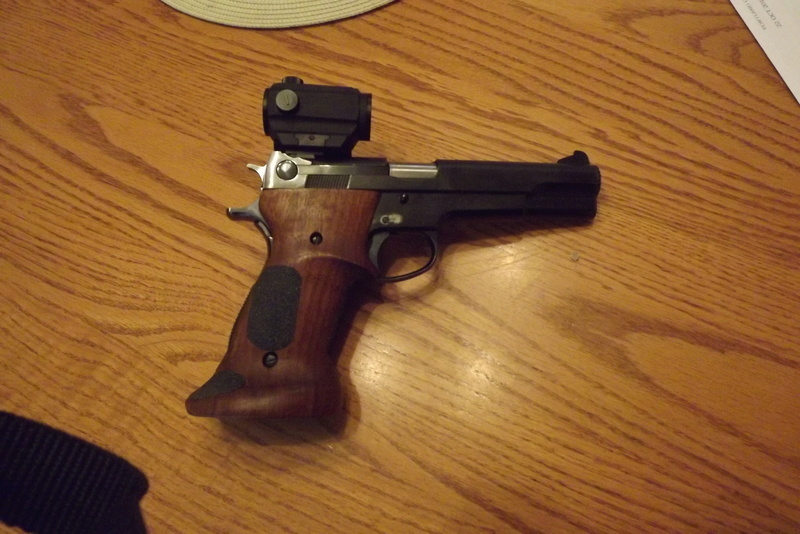 I have a BME S&W-52-RR on order. I can use a EGW BOMAR Doctors mount I have for now. i am sure I have a dot that will fit it some where around here. It is because the safety lever will not pass through it. Clarence thanks for the offer to talk on the phone but my hearing is so bad I don't do well on the phone and just stick with email and text when I can. I am not doing well with this forum tonight either as the last three responses I have typed and sent didn't post. I wear some of the best hearing aids there is but my hearing has gotten worst the last few years. Don't know if it is shooting indoors 5 days a week or just getting old. I wear good ear muffs and lately ear plugs also but when people are shooting ARs in the other lanes it is still loud. I am not going to complain because I shoot them also. I have had people complain about my 357 mag. Too bad we cannot talk. Good luck with your M52 journey. I'm assuming the first couple rounds will be non-functioning (no powder or primer). It REALLY makes me nervous when a live round gets jammed somewhere. STEVE SAMELAK wrote: I'm assuming the first couple rounds will be non-functioning (no powder or primer). Always I never attempt to cycle live rounds at home. Not that i don't always point the muzzle in a safe direction but i don't want the neighbors calling the law when they hear a gun shot. I make up a mag full of dummies and i have this stuff from Brownell's that turn brass black making them easy to ID. You can plunk them all you want in the barrel but that doesn't mean they are going to feed. Don, I had the RR mount on my 952 and it was nothing but a headache. There wasn't much room between the rings to get the 1" dot to fit and the MDII is even longer in the body area. The RR on the 952 also moved around on me. The anti vibration screw may stop vibration but it does not lock the front of the base in place. Part 2. I used the Leupold frame mount and you could remove the slide past the mount since it mounts on the right side. I would not recommend the Leupold to anyone that had a great finish on their 52. I found it abrasive to the bluing. Well I guess it's what we call button nose. Although the nose of the Remintons have a very small button on them it's not what I would call button nose although you may. Now that is a horse of a different color. I would never try to load those in an M52, only revolvers. And yes, they are a true button nosed LWC. I still call it a button on the Remingtons cause if loaded a tad to long, the button will scrape and cause issues in the M52 magazines. The reason I interjected was that I did not think the Zero's had the true button on them and the OP was not going to use them in the M52 because of that reason, when I believed they are good to go. Glad we got onto the same page here. Have a safe Easter weekend. I ran out of the Remington WC's last year and can't find anymore. To bad because I think they were THEE best although somewhat messy. We're on the same page, just that sometimes the written word can be misleading but not intended that way. Can't beat talking face to face. You have a Happy Easter. Yes I looked at the Zero's again and what I thought was the button is recessed and when loaded flush with the case it does not stick past the brass. My gun is out for delivery so I should be headed to the range soon to pick it up. LenV wrote: Don, I had the RR mount on my 952 and it was nothing but a headache. There wasn't much room between the rings to get the 1" dot to fit and the MDII is even longer in the body area. The RR on the 952 also moved around on me. The anti vibration screw may stop vibration but it does not lock the front of the base in place. Part 2. 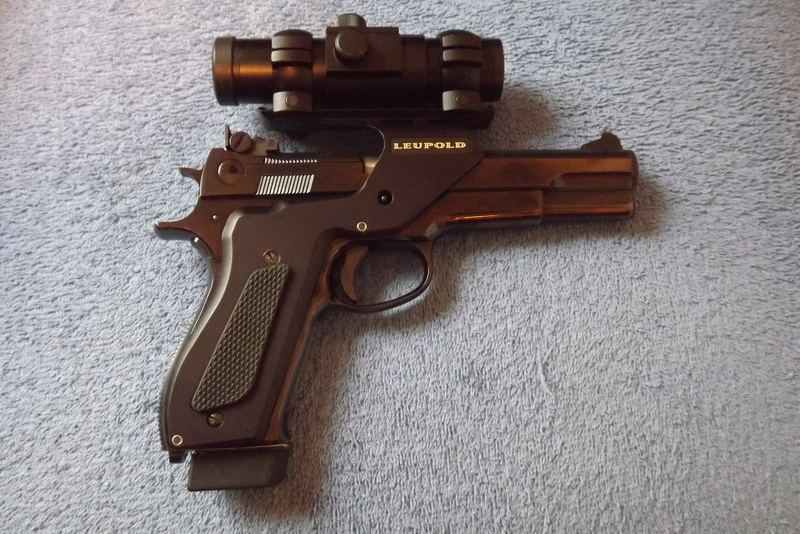 I used the Leupold frame mount and you could remove the slide past the mount since it mounts on the right side. I would not recommend the Leupold to anyone that had a great finish on their 52. I found it abrasive to the bluing. Let me know if you need a Leupold mount. Not putting mine back on.